Being the first baby of two surfers, it was inevitable that Eva's nursery would be inspired by the sea. We love to travel, particularly to the caribbean. This room reminds us of surfing in the caribbean waters, snorkeling coral reefs, and fishing underneath the pier!! Eclectic, thrifty, and interesting while staying uncluttered. The cornices were made using wood frames covered with circles of craft paper installed to create a mermaid or fish-scale effect. The jellyfish mobile was made using a piece of driftwood, sea urchins, and translucent circle garlands all pulled together using fishing line and lures. It captures Eva's attention without being tacky or obtrusive in the design of the space. The "dock" behind her crib was made using lumber from Home Depot and stained with a grey stain to make it look sun-bleached. I brought it 4" off the wall to give it a little bit of dimension. I also painted the lampshade to her 'sea urchin' lamp using an ombre technique to match the sea urchin jellyfish mobile. The rocking chair from Pottery Barn was the most expensive thing we purchased. The stool was from a rug shop in Richmond, VA. 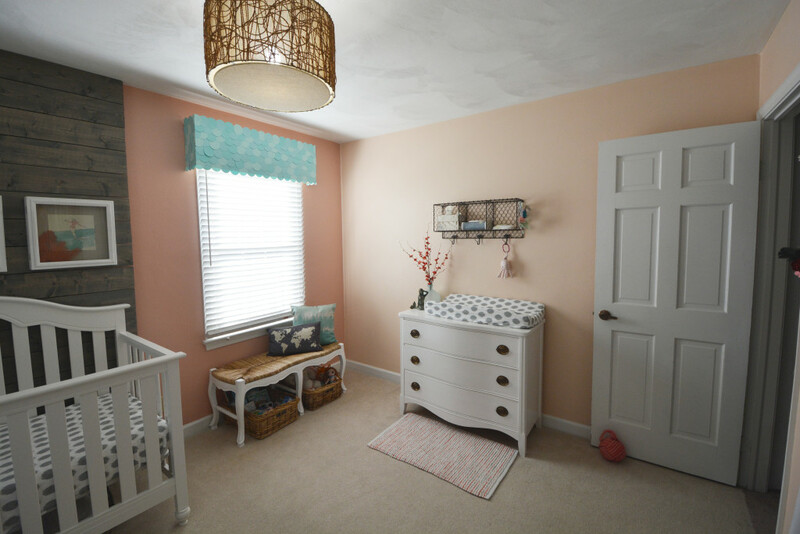 The dresser is from a thrift store, globe and ombre pillows were from easy, shelf and most decor was from TJ maxx, and the crib was from Wal-Mart!! Having diapers, cream, etc. accessible without having to dig in a drawer was one of the best things I did in this space. It is so easy to control the baby on the changing table and just quickly grab what you need! Also having a table beside your rocker is a huge help! This is such a cute room! I am making my sister-in-law a mobile like the one shown. If there any advice on how to acheive the sea urchin shells the color they are in the picture? Any advice or tips would be greatly appreciated!!! Also- how did you string the capiz shells and attach under the urchin shells? Hello! 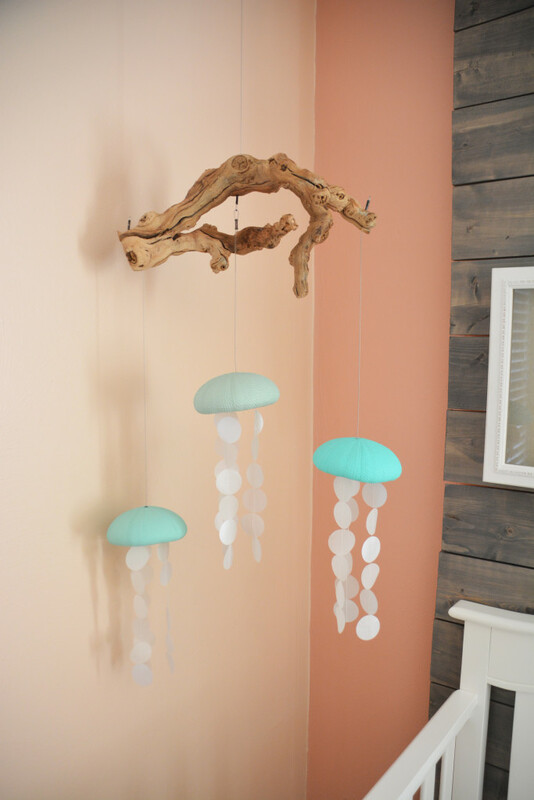 Any advice on how to create the jellyfish mobile? I absolutely love this idea for my son’s nursery. I went ahead and tackled this! If you want any ideas- you can message me through Instagram- chanel5ness. I could tell you where I found stuff and send pics of how mine turned out! Unfortunately I don’t have instagram ? Sorry! Reached out via Instagram to get your ideas and feedback on the mobile. Thank you! Hello I as well would like some guidance on DIY mobile you have posted. I added you on Instagram, I can’t message you without adding you.